The World Health Organization says – one out of two women diagnosed with breast cancer dies within five years in India. In the US, the fatality is less than one out of five, and in China, one out of four. Shortages of technology for early detection and radiographers coupled with the expense of regular screening, which normal people find too expensive to afford in India have led to an increasing number of breast cancer cases of late. Today, breast cancer has outstripped cervical cancer as the major cause of cancer death among women in this country. A Bengaluru-based tech startup and the brainchild of Geetha Manjunatha (CEO) and Nidhi Mathur (COO), NIRAMAI offers breast cancer screening solution by combining artificial intelligence, machine learning and cloud. 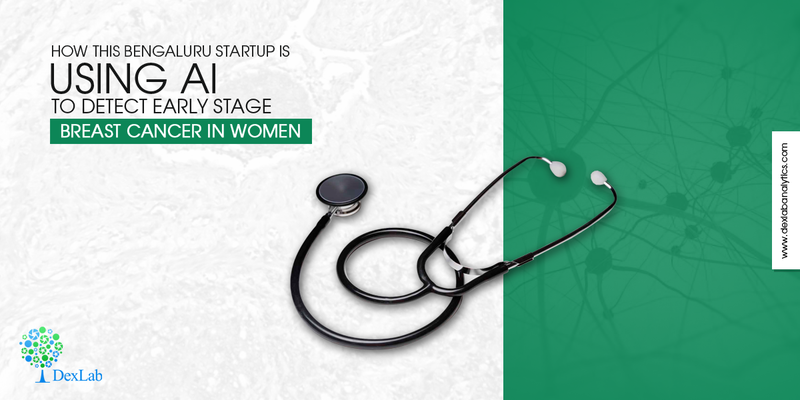 It aims at tackling the issue of accessibility and expenses of breast cancer screening. These two dynamic women had seen cancer very closely in their family and feel an emotional connect with anyone who is diagnosed with this deadly disease. This led to the conceptualization of NIRAMAI, which means BEING WITHOUT DISEASES in Sanskrit. Also, it’s an acronym for “Non-Invasive Risk Assessment through MAchine Intelligence”. For data analyst course in Noida, visit DexLab Analytics. The breast cancer screening solution by NIRAMAI is non-invasive, non-contact and non-radiation process of detecting early stage breast cancer amongst women of all ages. The deep technology that it claims to have patented is Thermalytix technology – a fusion of top-grade machine learning algorithms over thermal images. “Thermography is well known to sense earliest signs of cancer. However, traditional manual interpretation of a thermogram has not been accurate enough to become accepted as a standard of care. Interpreting 400000 colour values in thermograms and to diagnose breast abnormality is a huge cognitive overload to a radiologist – use of machine learning enables automated analysis and helps in better interpretation of thermal images and considerably improves the overall accuracy of diagnosis”, says Geetha, one of the cofounders of NIRAMAI. The working mechanism of screening in NIRAMAI is quite simple, and effective. The women who want to get screened need to relax for the first 10 minutes before taking up the test. Then a high resolution thermal sensor is kept at a distance of 3 feet from her to measure the temperature distribution on her chest and generate thermal images. Next, the NIRAMAI software scans these thermal images to automatically initiate a screening/diagnostic report and hands over a radiologist-certified report to the women. The test is performed in a highly intimate manner, the women undertaking the screening is neither touched nor seen by anyone. “This is unlike mammography which is based on X-Ray and is recommended for women above 45 years only once in 2 years. It is also noncontact and doesn’t require any breast compression; hence not painful. Since the equipment is very portable, it is amenable to be used in outreach programs being a rural camp or urban corporate screening,” she shares. In healthcare space, analytics and AI are dubious topics. It takes a lot to coax a doctor to use an AI tool as an aid in his diagnostic procedure – countless discussions, several experimental trials and after a lot of effort, NIRAMAI could finally step into and create a niche of their own. Another challenge was to have an edge over their competitors, who once knew that they are out with a revolutionizing technology, would like to sell everything to copy that. For that, they have armed themselves with 10 patents in this area, which is somewhat protecting them from other players. Since breast cancer is a big health issue in India, the NIRAMAI team feels that it is extremely important for women to go for regular screening. It is safe and in most cases, early detection helps keep cancer at bay. The power of analytics is huge. Arm yourself with a powerful data analyst certification Delhi NCR. It will help you go a long way!